The "IM" Internal Monitor is a newly designed, single valve body regulator with built-in monitor capability. It provides for complete monitor operation, including lock-up and control of over-pressure under many types of failures, internal or external. Parallel orifice with single valve body increases the safety of dual regulation. 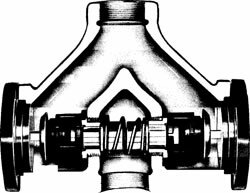 The single valve body design with inverted "Y" header give improved capacity and performance over welded or piped headers. Internal monitor regulators offer the added safety advantage of a second gas-tight lockup seat if the normal orifice face and valve seat fail to produce the adjusted outlet pressure. The monitor also controls gas flow between the failed open flow and no flow, thereby providing complete secondary regulation and monitor regulation function without relieving gas to the atmosphere or shutting off the gas flow.